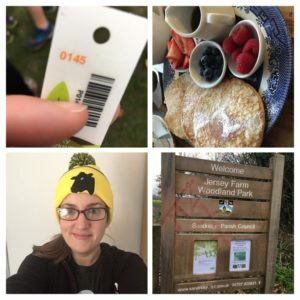 A parkrun, pancakes and afternoon tea- the perfect weekend right there! 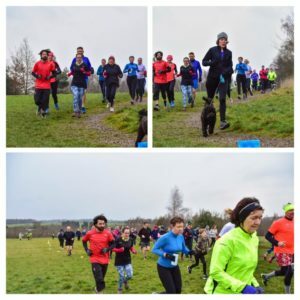 On Saturday morning I drove over to my parents house and then my brother and I walked the short distance to Jersey Farm parkrun, as Tony hadn’t run it yet. It was a fairly cold day and we even had some sleet at the start, so I regretted not bringing my gloves. Usually my hands warm up fairly soon, but even though I tucked them into my sleeves they were still cold the whole way around. Jersey Farm parkrun is two (and a little bit) laps of undulating grass and paths. It was enjoyable to run with Tony and we chatted as we ran around, not paying attention to the time at all. I finished with token 145, in a time of 32:31. As soon as we had scanned our barcodes, we retrieved our tops and jackets from the tarpaulin and headed down the hill into Sandridge Village, as we had plans to have breakfast in the Heartwood Tearooms. It’s around a half mile walk, so by the time we got there we were ready for breakfast. I’d not been to the tearooms before- I think they were linked to the parkrun at Heartwood Forest but the times I had run there I’d gone back to Mum’s for breakfast. Anyway, it was so cosy inside with a log burner, and they served delicious pancakes with fruit and maple syrup (Tony had pancakes with bacon). They had a really long tea menu, so I went for apple spice tea which was really tasty. When we finished the lady asked us if we’d done the parkrun (Tony had on his 50 top) and when we said yes she said “I’ve given you a 10% discount as parkrunners get a discount here” which was lovely, as we wouldn’t have known otherwise. They had a wonderful selection of cakes too (and the people on the table next to us had lovely looking toasted teacakes) so I am trying to work out when I can next organise a visit! As Ellenbrook Fields and Panshanger just have coffee vans it’s nice to have a local one where we can actually go to a (warm) cafe after for more of an authentic parkrun experience. We then walked back home along Jersey Lane which is a path used by walkers and cyclists before I drove home. Andy had been decorating the kitchen so I had time to admire his handiwork before getting ready to go out again. After a shower I had to quickly get ready as I was heading into London in the afternoon. Annoyingly there was only one train per hour so I had to be careful to be there on time! 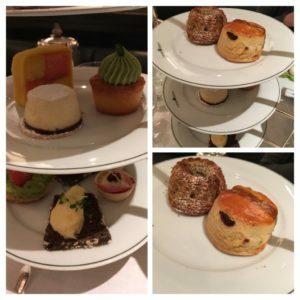 I met some friends for afternoon tea in a hotel close to Covent Garden (The Delauney). The food was really good- the veggie savouries included a sort of pretzel roll with smashed avocado, lime, tomatoes and basil, some lovely little goats cheese and beetroot mini tarts and some smoked aubergine on rye bread (plus an egg on rye which I didn’t have). It was Austrian-themed, and so all the cakes were ones that I loved- a little Battenberg (mmmmm marzipan), an amazing pistachio cupcake and then a little berry cheesecake bite. For the scones course (level?) you could have scones and strawberry jam, poppyseed gugelhupfs (little light bread cake type things) with apricot jam, or a mixture, so we went for the mixture. The tea was proper loose leaf tea and we never had to ask for the water to be topped up, as wait staff would come by every now and then and if they needed topping up with water they just did it. It was lovely to catch up with my friends too, of course. My train didn’t get in until 7.20, and Andy walked and met me so I wouldn’t be walking back in the dark. On Sunday morning I headed out for a long run. I still don’t have set routes (we’ve lived here for nearly 3 years now so I’m not sure why)- I wanted to do at least 10, and ended up doing 11.5, taking it steady and stopping to take photos. It was such a gorgeous day- really frosty with huge icy puddles. I love days like this- it was peaceful to be out, and every time I ran into a new field or along a new track I’d be greeted with another stunning view of frosty fields and blue skies. I was still fairly cold when I got home though, despite wearing 3 layers. On Saturday on Andy’s request I’d popped into the amazing Swedish bakery in Covent Garden to pick up a couple of cinnamon rolls. He’d been doing more decorating while I was out running, so I had a shower and then made us some tea and he had it as elevenses and I had it as breakfast (plus some fruit and yoghurt for me). They are sooooo tasty- I cannot recommend them enough! We walked into town a little later as I needed to get my glasses adjusted again (too tight- too loose- hopefully now just right?) and then I had a lot of work to get through. 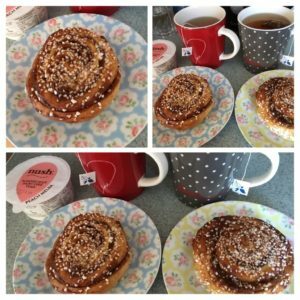 Pancakes, parkrun, afternoon tea, cinnamon rolls= that’s a good weekend right there! If your parkrun has a cafe do you tend to visit it often? Do you know of any good afternoon tea places (particularly in London- we are always after recommendations)? 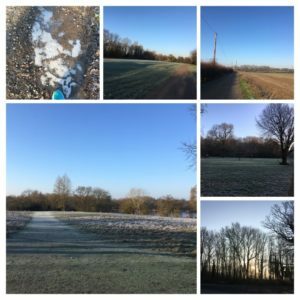 Author Maria RunsPosted on January 23, 2019 Categories General ramblings, Running, Stuff I love! Ooh that afternoon tea sounds really good! There are a couple of cafes close to our local parkrun but we don’t often go as we usually meet Steve’s brother for something a little later in the morning. That means we have time to nip home for a quick shower and change first. Oooh love the sound of that afternoon tea! Mmmm. I heard there was a rather quirky one in London – Alice and Wonderland themed which always sounded intriguing. Ooh yes one of my friends has been there- you get little bottles that say “drink me” and things like that. Next Next post: Snow reason not to run!